The 2015-16 season of Musical Ecologies concludes Thursday May 19 with the debut of Tom Chiu’s Ensemble Metrix, a new mixed-instrumentation group dedicated to adventurous music in diverse genres and styles. Featuring Rachel Golub, Meaghan Burke and Chiu on strings, Sara Schoenbeck on bassoon; Danny Tunick on percussion, Ensemble Metrix is a vehicle for Chiu's vision of the performative party band, replacing DJ's and turntables with live musicians who spin extended jams, morphing melodic fragments and motivic riffs from specific bands or genres from the pop/rock idiom. Framed by Chiu’s pre-composed sonic design, these long-form structures are infused with improvisatory flair from each individual performer. The evening will begin with a conversation hosted by series curator Dan Joseph, and a reception will follow. 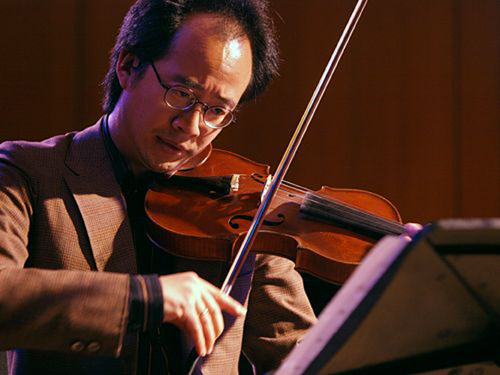 A dedicated champion of new music and recipient of the 2014 Chamber Music America Commissioning Grant, violinist/composer Tom Chiu has performed over 200 premieres worldwide by influential musicians including Muhal Richard Abrams, David First, Oliver Lake, Alvin Lucier, Michael Schumacher, Henry Threadgill, and the late Ornette Coleman. His extensive discography includes recordings for the Innova, Koch, Mode, Sombient, and Tzadik labels. His original works, dedicated to artists such as Joan La Barbara, Bobby Few, Max Mandel, the Downtown Ensemble, and the OpenEnded Group, have been premiered at experimental venues such as Mount Tremper Arts, EMPAC, Roulette, STEIM Amsterdam, Walker Art Center, Museum of the Moving Image, and Anthology Film Archives. As founder of the FLUX Quartet, he has led a pioneering new-music group which has become “legendary for its furiously committed, untiring performances.” (Alex Ross, therestisnoise.com). Chiu holds degrees in chemistry and music from Yale and a doctorate from Juilliard. Comments closed — Trackbacks closed RSS 2.0 feed for these comments This entry (permalink) was posted on Thursday, April 21, 2016, at 2:33 pm by Dan Joseph. Filed in press release.